After all the craziness of activity during the month of May last year, I was definitely gearing up for another summer of endless bubble clouds and flukes, like my previous two seasons had been. This included stocking up on memory cards, printing out fluke guides and prepping our summer New England Aquarium interns to be able to help spot blows and collect a fury of data in the midst of a whale feeding frenzy. The end of spring brought a bit of a storm and several days of fog – once the fog cleared, we found a dramatically different Stellwagen Bank than we did in mid-May. The beginning of June found us on primarily on the Northwest corner, with sightings of Reaper, Shuffleboard, Boomerang, Mogul, Hornbill, Sedge, Pinball, Satula and Venom. On June 5 we were treated to some spectacular open-mouth feeding by Venom and Shuffleboard, but overall the month was quiet with only several humpbacks and fin whales, a few minkes, and very few birds – mainly gulls and Northern gannets were of the few we saw. By mid-June we spent most of our trips up north on Jeffrey’s Ledge, with our two main whales of the month—Satula and Pinball. Most of what we saw these two doing were subsurface bubble feeding, a feeding technique which utilizes bubble blasts to corral bait into a tighter ball, and lots of defecation (my favorite behavior to point out!). 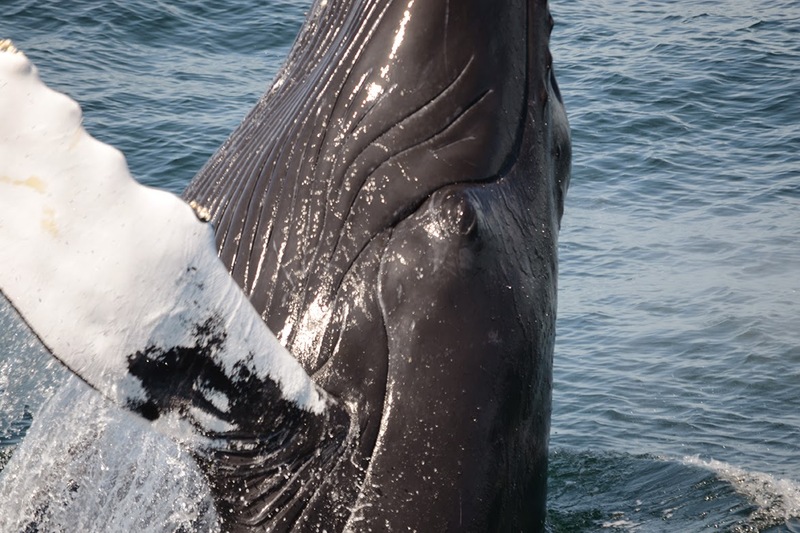 While it isn’t the most pleasant of topics to talk about, there is actually a lot of important information scientists can learn from whale feces. Needless to say, we saw a lot of it, which is great to see from an endangered population. Pinball and Satula were usually seen in the same area unassociated, but one day in June we were surprised to find them feeding, rolling around and slowly slapping tails together! By July, things slowed down even more – and for the majority of the month we spent time with our leading lady Nile, named for the river-like marking on her left fluke. 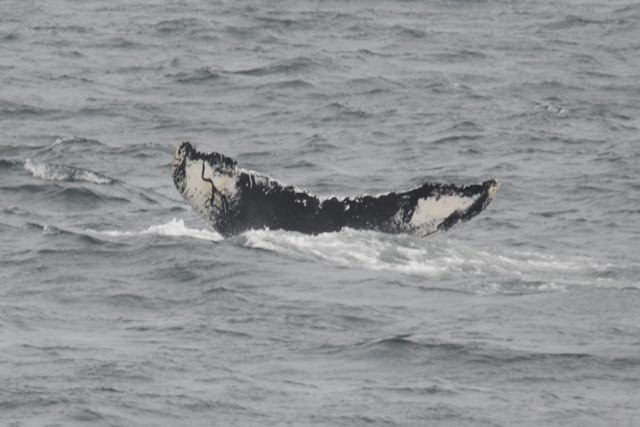 Other than a sighting of humpback Mudskipper and some Atlantic white-sided dolphins early in the month, Nile was pretty much the only whale sighted in the Stellwagen area for the month of July. 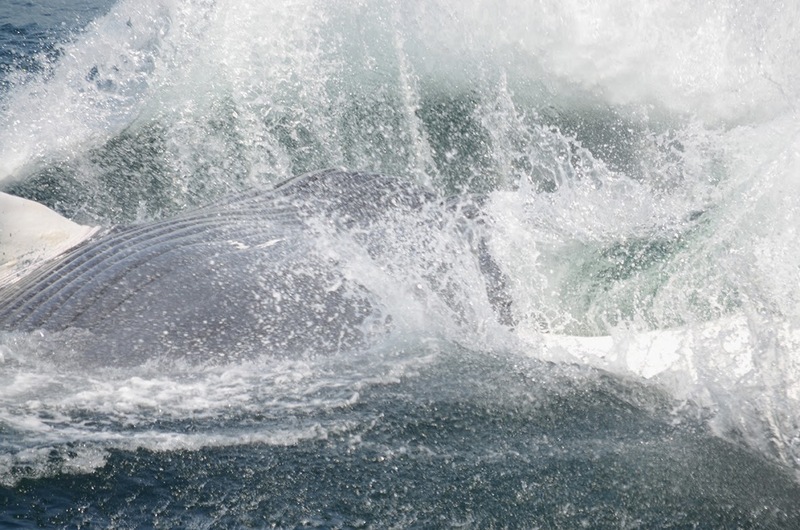 We usually found her on her predictable spot on the SW corner, subsurface bubble feeding or deep feeding, but occasionally she would surprise us with spectacular displays of head breaching (i.e. chin-slapping the water! 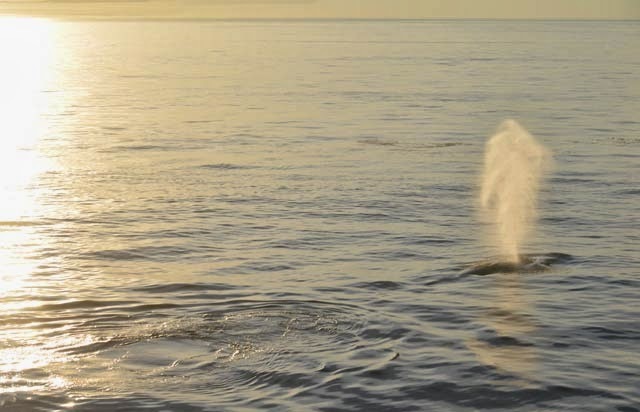 ), or sometimes takes big gulps at the surface filtering out seawater through her baleen. One of our naturalists included the following in her trip notes from July 8: "Next, we found Nile again. She was textbook deep feeding, until on the surface where she lunged out of the water and slapped her chin on the water. This was followed by a series of full breaches right next to the boat! It was one of the best trips I’ve been on this year!" We occasionally had sightings of fins and minkes, and with the exception of Vulture feeding with Nile on the 23rd, Nile was almost always sighted alone for most of July, much like a solitary fisherman set at his favorite fishing spot. 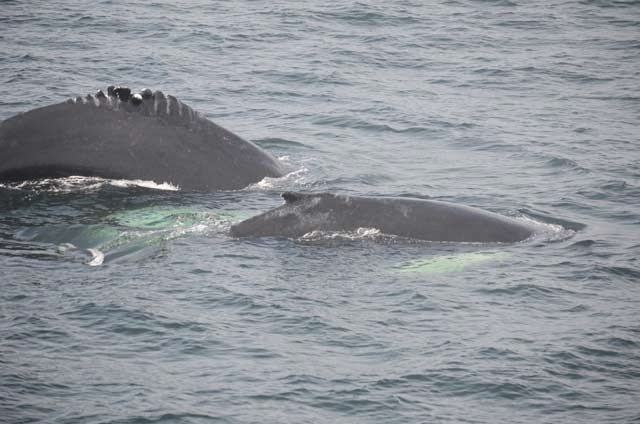 And it wasn’t just a slow summer for humpbacks at Stellwagen – there were a lack of seabirds as well. Some of our favorite visitors such as the Great Shearwater – were sighted few and far between from June to September. This summer, a team at the Stellwagen Bank National Marine Sanctuary office satellite tagged several shearwaters to learn more about their distribution – and as you can tell from the maps, they didn’t spend much time on Stellwagen. Whatever is the case, hopefully this coming season we will see a bit more activity. But as I stated in my last post, every day on the water is different and seasons can vary based on the prey availability and other environmental factors. That’s one lesson I’ve learned about ecology—change is constant. 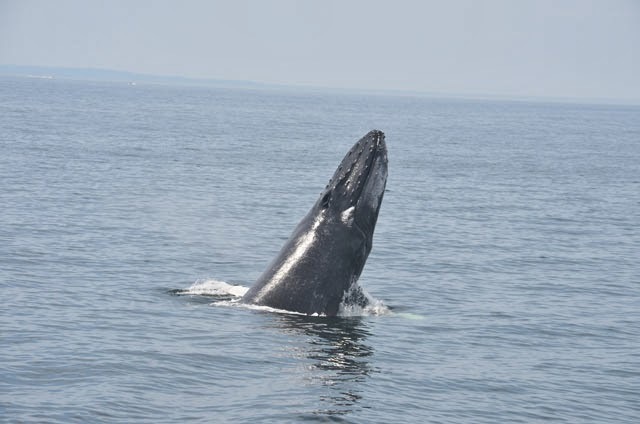 This summer was also another lesson in learning to share the whales (or whale I should say). We often had many different whale watch boats from several companies all watching Nile, so it was essential that whale watching guidelines were followed in order to respect this protected species. 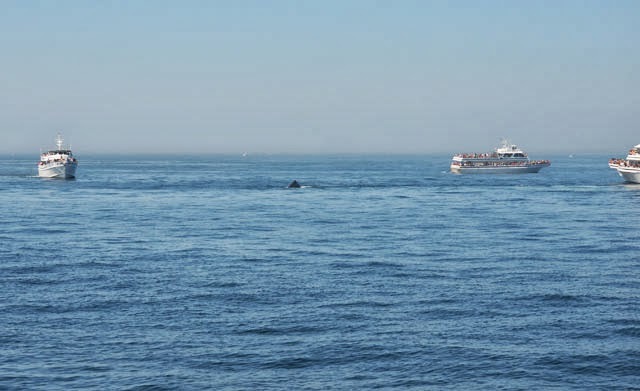 All whales, dolphins and porpoises in the northeast region are federally protected by the Marine Mammal Protection Act. Read more. 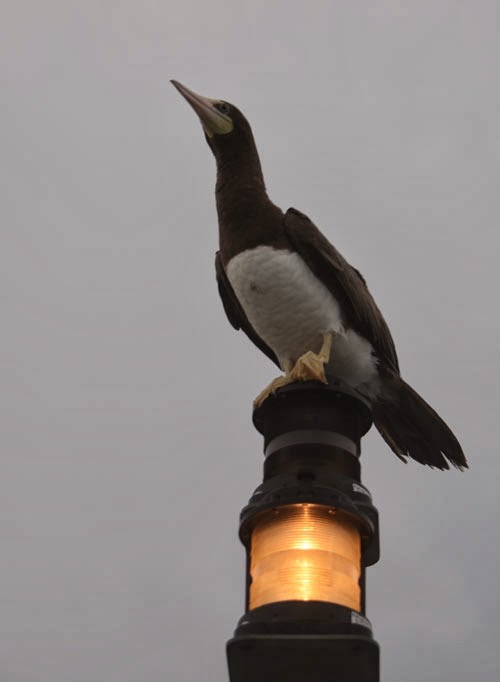 Despite the low seabird sightings of typical Stellwagen birds like the Northern Gannet or Great/Sooty Shearwaters, we had an exceptionally rare Brown Booby sighting on July 7th! This tropical visitor even made headlines after it landed on our boat during a sunset whale watch and hitched a ride all the way back to Boston (and later Hingham where our boats dock at night). Environmentalists came the next morning to locate the bird, but by then it had flown from the vessel. It was certainly an exciting and unusual sighting! 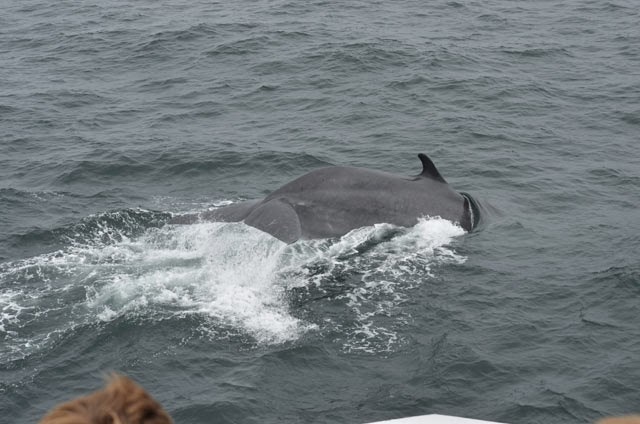 We also had great looks at a fin whale fluking on the 12th. 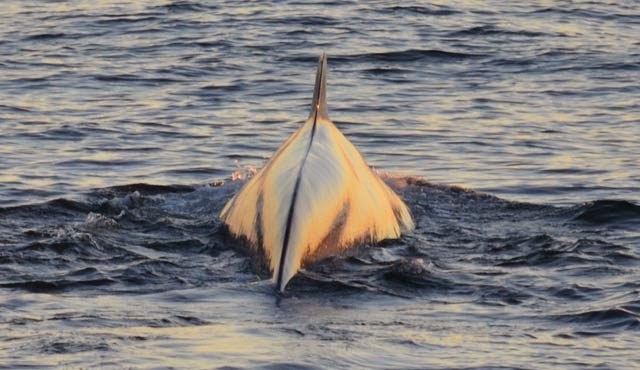 Seeing the fluke of a fin whale is always a rare treat. 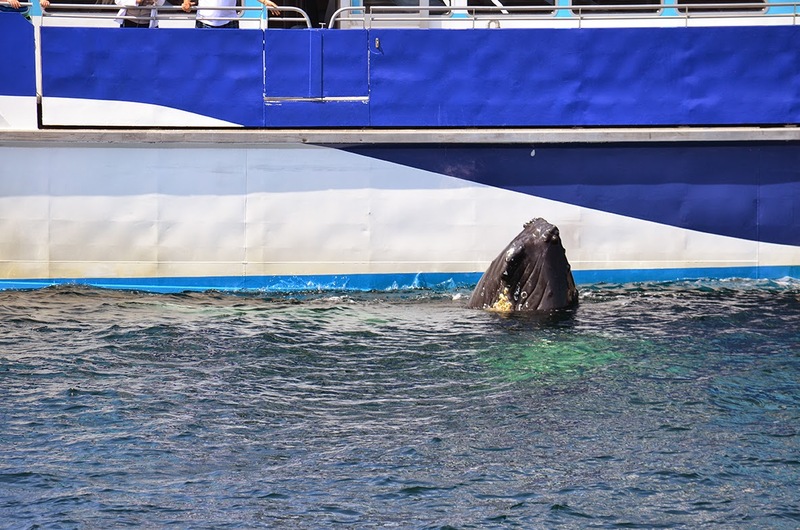 Their streamlined shape makes it so they typically don’t need to lift their tail out of the water to dive, unlike the more-buoyant humpback that uses it to help push themselves deeper. By the end of July we started spending more time in the middle of Stellwagen bank near the Boston shipping lane, and also started seeing Pinball and Satula, along with Nile, exhibiting more subsurface bubble cloud feeding. 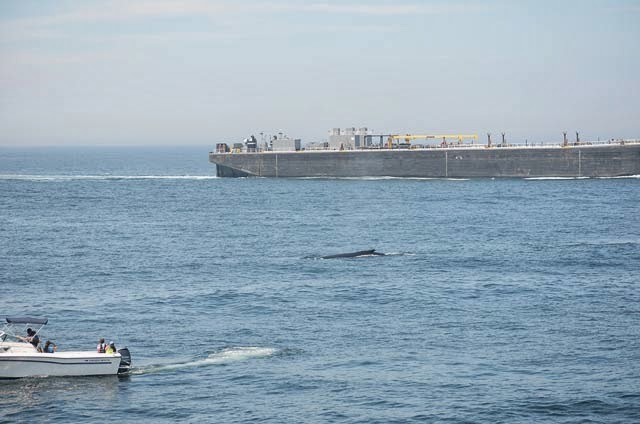 Though our sightings were still few – it was still interesting to see activity so close to the recently moved Boston Shipping Lane, which was moved in a collaborative effort to reduce the impact of potential ship strikes with large whales. Read more. Overall the SW corner tends to be our usual hotspot – but yet again, every season is different! 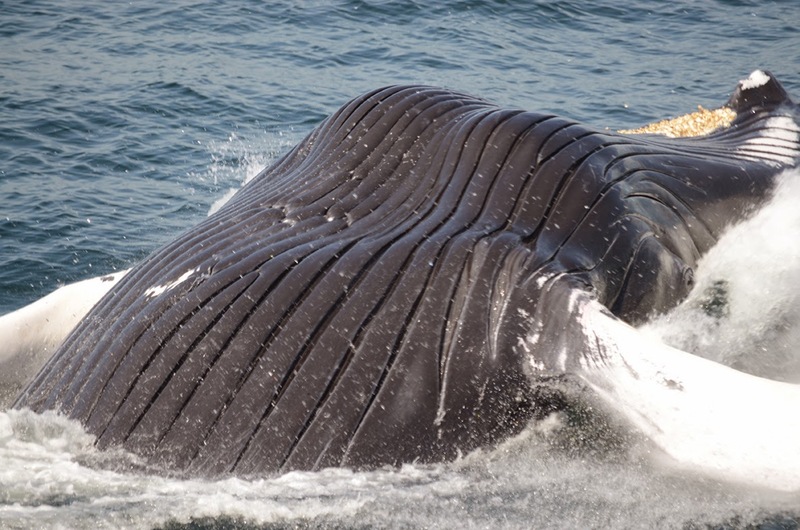 Ship strike is one of the biggest threats to mortality and injury to large whales, which is one reason why collecting GPS location data of where the whales spend their time is crucial. 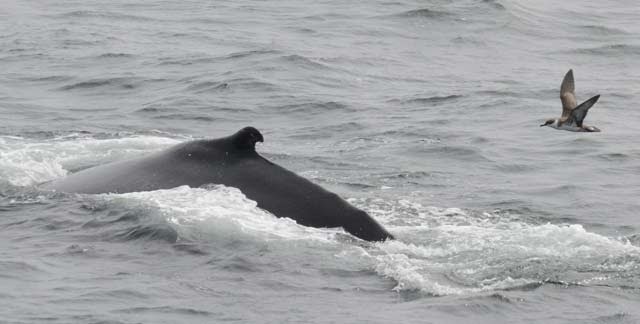 We also spotted humpback Fulcrum and her 2013 calf! Fulcrum has an injured dorsal fin due to both a boat propeller wound and an entanglement in fishing gear. Besides humpbacks, we also had sightings of Minkes (some of them lunge feeding! ), Fin whales, blue sharks, basking sharks, and more gannets. 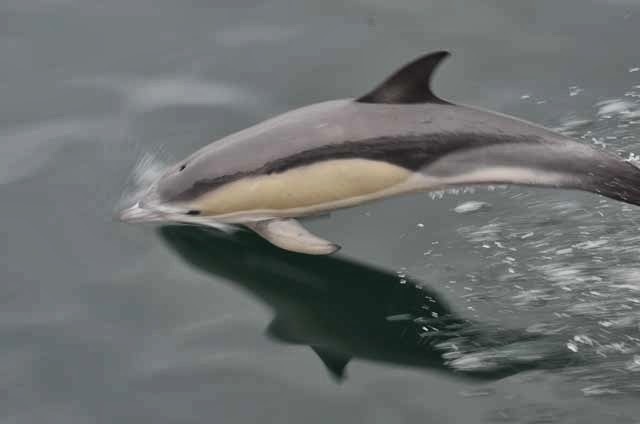 By August a few more flukes were seen in the area including Colt (who exhibited his famous curious nature by swimming under our boat), Doric, Decimal, Geometry, and Etch-a-Sketch. Nile was seen associating with other females including Pinball, Scylla, and Tongs – sometimes flipper slapping, logging, or deep feeding together. Humpback Mogul put on a spectacular display of breaching on the 16th of August – which including 15-20 repeated full breaches and flipper slapping right in front of the Aurora! Mogul is often seen alone feeding, but occasionally puts on a show like he did in August – making him one of my favorite humpbacks and one of my favorite sightings from 2013. 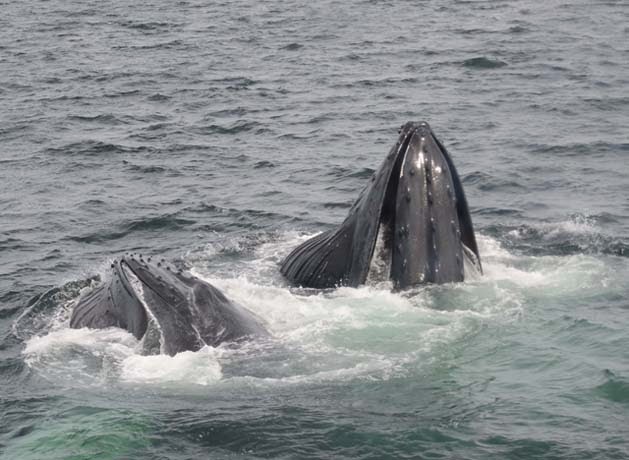 Besides exciting humpback behavior, August didn’t spare with other species. Early in August we watched a fin whale appear to bubble cloud feed. We observed it making deep bubble clouds and turning at the surface each time the cloud came up – much like humpbacks do! There have a been a few documented cases of a fin whale bubble feeding, but I’ve never seen it myself and was quite excited to see this rare behavior from a fin whale. Something truly unexpected to see! By the end of August, we had a few more calf sightings including Valley and Clipper, and their 2013 calves. 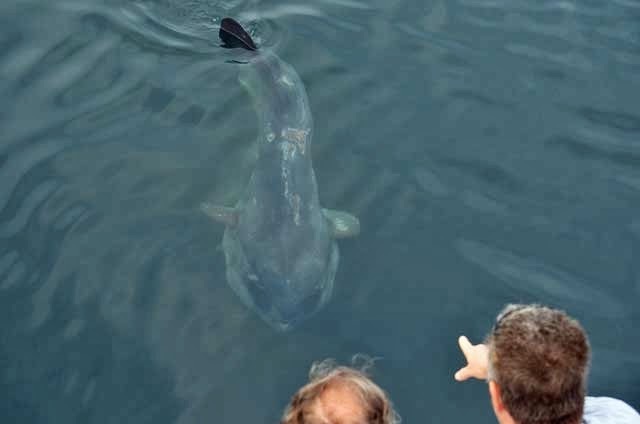 We also had a lot of ocean sunfish (Mola mola) sightings – including this exceptional close-to-boat look alongside our vessel Cetacea. Labor Day weekend started out with some fog, but then treated us to sightings of Common Dolphins (with some calves alongside!). We also enjoyed the new flukes of Pepper, Piña and Sirius. Mogul also surprised again with some tail breaching and tail flicks. We're hopeful and excited that it's going to be another tremendous season on Stellwagen Bank. And it all starts today! 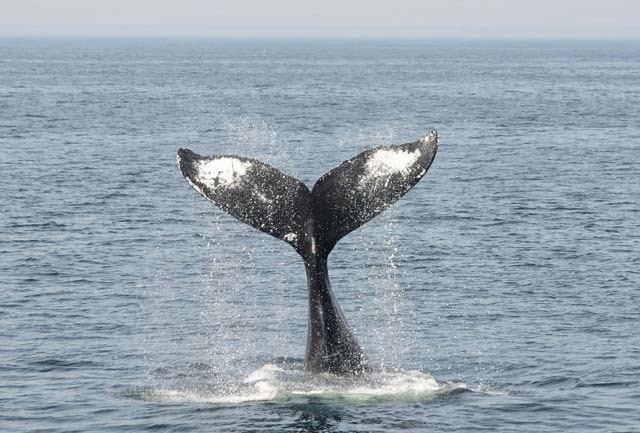 Click to buy tickets for your whale watch adventure online.